It’s Friday, y’all! That means it’s time to par-tay! It hasn’t been a very productive week for me, so here’s hoping that y’all have some inspiration for me! 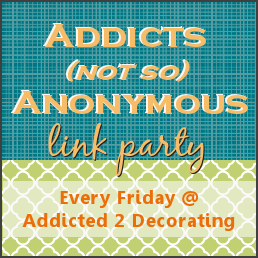 Welcome to Addicts (not so) Anonymous No. 4!! Hope all is well – have you planted your garden in your boxes yet? Yes, I have! Most everything is growing in nicely…although not nearly as quickly as I’d like…LOL. I’ll have to take some updated pictures. We did have a few things not come in. Probably the wrong season for planting those particular things. Thanks for being such a wonderful hostess Kristi =) Have a wonderful weekend!! Thanks for hosting! Hope you have a wonderful weekend. Hi Kristi! Have a fabulous weekend. Thanks for hosting. Another fun party of ideas this week! Thanks. It’s shaping up to be a fabulous party, once again! Your the hostess with the mostess! Yipee, I was finally able to post onto your link party! My computer would always freeze when I tried to open your link party posts, until today. I got the idea to click on the compatibility view on my browser and it worked (wish I would have thought of that months ago, lol). Anyway, thanks for hosting and have a great weekend. Thank you so much for hosting. This is my first time partying at your blog. I am a new follower and just love your style! Thanks for hosting! I got my link in just under the wire! Have a fun weekend!